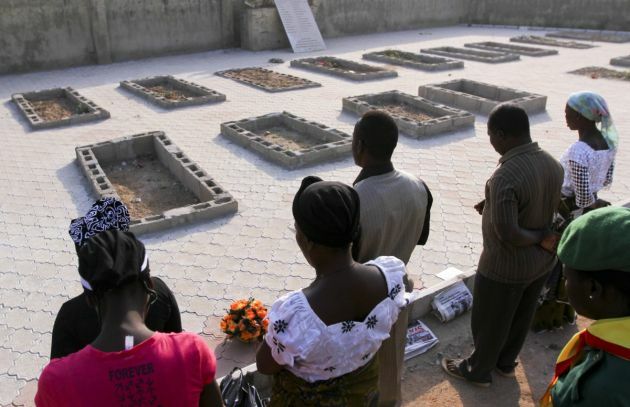 (Photo: Reuters / Afolabi Sotunde)People pray near the graves of victims of a suicide bomb attack during a memorial service at St. Theresa's Church in Madalla, on the outskirts of Nigeria's capital Abuja, December 23, 2012. Boko Haram has killed hundreds in its campaign to impose sharia law in northern Nigeria and is the biggest threat to stability in Africa's top oil exporter. At Christmas, the police and military ordered security to be tightened, people's movement restricted and churches to be guarded. But such is the commitment to religion in a country with Africa's largest Christian population that millions of people will pack out thousands of churches in the coming days. It is impossible to protect everyone, security experts say. Picture taken Dec. 23, 2012. ABUJA (Reuters) - Nigerian President Goodluck Jonathan signaled on Wednesday he would consider offering an amnesty to Islamist militant group Boko Haram, in an effort to end an insurgency that has killed thousands. "Goodluck Jonathan has approved the constitution of a Presidential Committee to constructively engage key members of Boko Haram and define a comprehensive and workable framework for resolving the crisis of insecurity," his office said in a statement. Boko Haram, a group fighting to create an Islamic state in religiously mixed Nigeria, has become the greatest threat to stability in Africa's biggest oil exporter and most populous country, since an uprising in 2009. The group mostly targets security forces but has attacked several churches, mosques, schools and markets, increasingly using suicide bombs. Christian southerner Jonathan has been largely unsuccessful in quelling the violence through military means and, in recent weeks, traditional leaders in the predominantly Muslim north have put pressure on him to offer Boko Haram a deal. Western governments are increasingly concerned about Nigerian Islamists linking up with other groups in the region, including al Qaeda's West African wing, particularly after a spike in kidnappings of foreigners this year. Jonathan had previously said that he would only engage Boko Haram in dialogue once it had ceased attacks and when its secretive leaders come out of the shadows for talks. Boko Haram's leader Abubakar Shekau has said in the past he was not interested in talking with the government. Any peace process would be complicated by the group's ill-defined leadership structure and the existence of spin-off Islamist groups. Jonathan's Minister of Special Duties Kabiru Turaki will chair a 26-member committee to develop a framework for an amnesty through which disarmament could take place within 60-days, the statement said. A 2009 amnesty for militants in Jonathan's home region, the Niger Delta, led to tens of thousands of men laying down their arms in return for stipends and training. But Delta militant leaders were well known and showed willingness to negotiate, unlike Boko Haram, and an attack by ex-militants in the Niger Delta that killed 12 police officers earlier this month showed the fragility of that peace.